The same rules apply to all players whatever their profile or size. Outbound traffic is charged and inbound traffic provides revenue. The price scales automatically to the member's actual throughput. Everyone benefits from a fair price, transparently, whithout any commitment. The amount, either payable or receivable, grows as throughput increases. Inbound and outbound rates, aggregated on all allocated ports, are measured every five minutes. Their respective monthly value is determined using the 95th percentile method. The prices per Mb/s are calculated using continuous functions applied to monthly values, from the first bit. 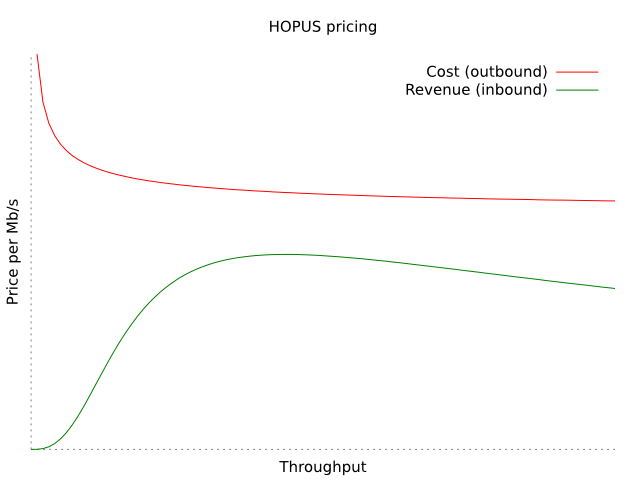 For outbound traffic, it's a decreasing function providing a degressive price, in a similar way to usual IP transit. For inbound traffic, the Mb/s price increases progressively in order to support the development of access networks' infrastructures then slowly decreases to accomodate high capacity transport. Additionnal monthly fixed fees apply to ports usage, according to their type (Gigabit, 10Gigabit, etc). Access to the service comes with a flat monthly fee based on privileged access mode. This service is only for network operators. On approval, you'll receive a confirmation email.